Did you know it’s PENGUIN season? Or as I like to say (apparently) PINGUIN. I also pronounce it in a New England accent. It’s strange. It happens. I say a lot of words strangely compared to other Ohioans. But they are normal to me and I am in no rush to correct my weirdness. Plus, if I did change, then I would no longer be Mallory, but a polished version…and where is the fun in that? So, yes, I like penguins. Who doesn’t? They are dressed up birds. God gave them tuxedos for their daily attire. Seriously, they are top notch birds. Fancy. Plus, they waddle. Which is hilarious to watch. A waddling bird in a tux….funny. That is the reason that I like them so much, they make me giggle. And then the giggling turns into all out laughter, and then the laughter turns into a cackle. So penguins make me cackle. I love it. You can guess then that I was ecstatic when recently, penguins suddenly became the new Christmas animal/decoration. Have you noticed this shift? 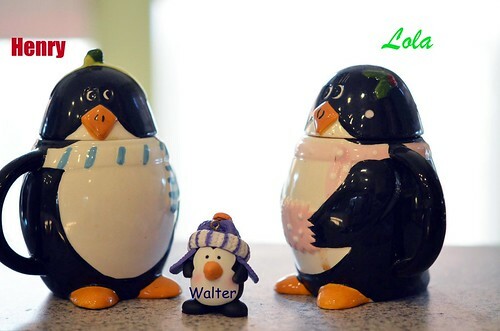 I have and maybe its because I am looking for them, but penguins are everywhere when the Christmas season rolls around. (and lets be serious here…it is no where near Christmas season yet, but more like Thanksgiving season, but the poor turkey gets the shaft…Halloween is over and here comes Christmas. Poor Tom.) Anywho…today, I bought 3 penguin ornaments (my tree is more or less penguin themed). Target, World Market, and Jo-Ann Fabrics were decked out in Christmas. I couldn’t resist. I was already in the holiday season/mood. I was weak already. 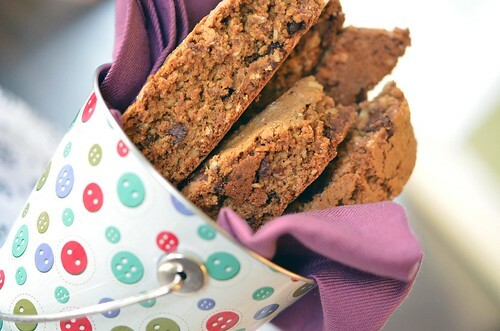 Not only do I have this urge to put my Christmas tree up, but I made these here gingerbread chocolate chip biscotti this morning. Gingerbread just hollers Christmas. I didn’t have a chance against the penguin onslaught. 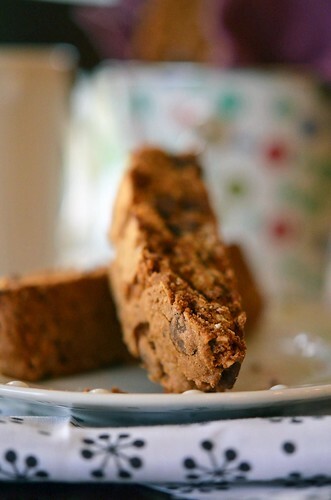 Biscotti…the perfect companion to any coffee or hot chocolate break. Actually, it is great with a glass of red wine or a cold glass of milk. Trust me. I tested this theory. Extensively. It’s hard work, but someone has to do it. I was a little leery of the chocolate gingerbread combination, but then I thought…what doesn’t go well with chocolate? OK, maybe eggs, but that is like the only thing I can think of right now. So, I went for it. And guess what? Home Run my friends. Home Run. I love these crunchy slices of heaven. I am generally not a crunchy cookie fan, but these are my exception. I hope they become your exception too! Process 1/2 cup of old fashioned rolled oats until finely ground. 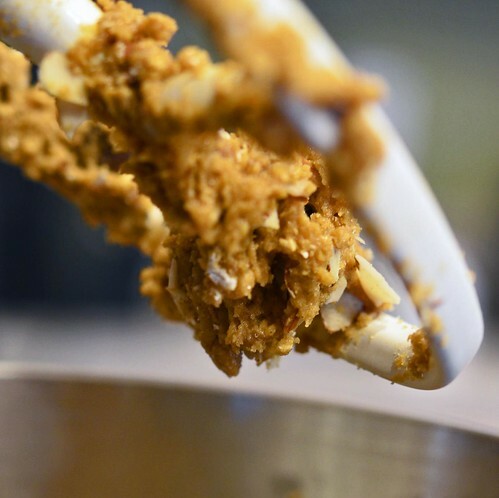 In large mixing bowl, combine processed ground rolled oats, remaining rolled oats, flour, brown sugar, salt, baking soda, baking powder, cinnamon, ginger, and clove. Set aside. In a medium bowl, whisk together eggs, vegetable oil, molasses, and vanilla. Empty dough out onto a lightly floured surface and divide into two. Shape each half into a log, about a 12 inches long and 2 inches wide (give or take). Transfer logs onto parchment lined baking sheet and place in oven for 30 minutes. Remove from oven and let cool for 10 minutes. Reduce oven temperature to 300ºF. After 10 minutes, cut each log into one inch slices. 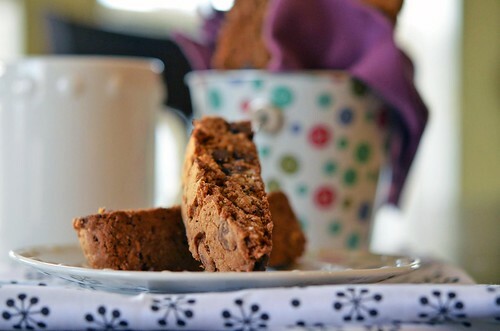 Cut on the diagonal to make biscotti longer and more traditional looking. Place back on parchment lined cookie sheet, cut side down, and bake for 7 minutes, flip slices over, and bake for an additional 7 minutes. Remove from oven and let cool completely before enjoying. Store in air tight container. These also can be frozen. « Brussel Sprout and Radicchio Salad w/ Bacon Vinaigrette.